...coffee information, coffee history, trivia, and other fun-entertaining coffee stuff! Upon further investigation he discovered that they were quickly and happily consuming the berries of a native bush. Still recovering from his depressing dream, Kaldi, pinching himself to make sure he really was awake, decided that what’s obviously good for the goat must be good for the goat herder. He thus descended upon the bush with abandon, gulping berries with unbridled enthusiasm! Soon he became full of vigor, completely forgetting his bad dream, and joined in the happy dance with his goats. It would have been a sad thing that day if Kaldi had taken this discovery to his grave but, thankfully, fate took a much kinder twist. One fine day a monk happened by to discover a mesmerizing ballet of sorts going on with Kaldi and his goats. In his astonishment, he questioned Kaldi in regards to the origin of such riotous celebration. Kaldi joyfully shared the story of the bush and the magical berries. The monk, being a wise old soul, perceived the magical enlightening berries as a divine revelation of sorts, a gift from God as it were, solving his problem of falling sound asleep during meditation. He saw it as a way to help his brothers solve similar problems with focus and concentration desperately needed during long hours on the... uh... the internet! Yeh, that's it! More coffee information related to ORIGINS Coming Soon! A coffee tree produces an average of one and a half to two pounds of coffee per year. That represents from 3 to 4 thousand hand picked coffee cherries and 6 to 8 thousand coffee beans. (A normal cherry contains two beans but ten percent of the time the cherry contains only one bean: the mystical and highly prized pea berry!) How's that for exciting coffee information? Now just let me get out my calculator here: Let’s say 1.5 pounds yield per tree, per year. 2.4 billion pounds of coffee are sold annually in the U.S. alone. That means that approximately 1.6 billion trees are required annually just to supply the U.S. When people say it’s a small world, well it just makes you wonder. According to my coffee information: If you were good at picking coffee, your work would yield about 10 baskets of coffee cherries per day, about 60 pounds. In the end this would yield 2400 cups of coffee! One shot of espresso uses approximately 45 coffee beans. The trunk of my Honda Civic holds exactly, O.K., give or take a bean, 1,873,398 green coffee beans. Is this relevant coffee information? Just seeing if you’re paying attention. More bean-related Coffee Information coming soon! 8 oz. Cup = 85 to 110 milligrams. Espresso-single shot= 35 to 45 milligrams. Brewed tea weighs in at about 40 milligrams. An entire coffee tree of average size = approx 6000 milligrams. A 150 lb. bag of coffee = approx 510,000 milligrams. And just for fun: The trunk of my Honda Civic filled with coffee = approximately 1,530,000 milligrams and I do mean approximately. Arrowhead Stadium, KC: O.K., O.K., I’m still working on this one. The term “Coffee” comes from the Latin, Coffea, a member of the Rubiaceae family, including more than 500 genera and 6000 species of the tropical tree or shrub. All coffee is grown within 1000 miles of the equator, from the Tropic of Cancer, to the Tropic of Capricorn. Coffee is second only to oil as a commodity and second only to water as a beverage. 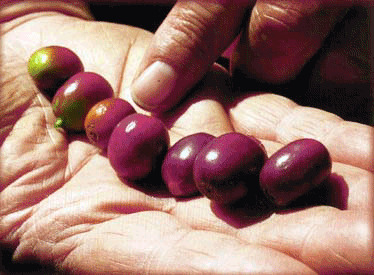 Coffee trees take three to four years to mature and bear fruit but they will produce for 20 to 30 years. The Japanese bathe in coffee grounds mixed with fermented pineapple pulp to reduce wrinkles and improve skin tone. I don’t know….? In parts of Africa, coffee beans are soaked in water and spices, and chewed like candy. Yum! Oh, here’s a good one: Coffee is actually a fruit! Let’s see, we’re supposed to get how many servings of fruit every day?! Coffee is a most complex beverage, boasting over 800 flavor influencing components. Wine, by comparison has only 150. Here is a mind blower! 80% of the world's coffee is produced on family farms of 12 acres...or less! More coffee information / fun facts, COMING SOON! The year 1689 saw the first café opening in Paris. There was a time in our history when you could be executed for harming a coffee plant. At the same time in another part of the world, you could be executed for having one! Ironically, Kenya imported its first successful plants from Brazil while the actual origin of coffee was only some hundreds of miles away in Ethiopia! It’s a good thing coffee plants are self-propagating. The heritage of the vast number of coffee plants in the French Colonies, South and Central America and Mexico can be traced to ONE plant that was a treasured gift given to King Louis XIV in 1714! Coffee was denounced by many religious leaders as the drink of Satan. Coffee houses were known as “hotbeds of sedition”. In the 1700’s many coffee houses were ordered to close. For failing to comply, the punishment for first time offenders was public beating and humiliation. Second (and last) time offenders were sewn into a leather bag and thrown into the river. Think about that the next time you order a Latte! In the year 1773, tea was replaced by coffee as the national drink in the Americas when angry colonists were enraged by King George’s enormous tax on tea. This of course led to The Boston Tea Party where the new nation gained its strong allegiance to coffee. Much of the U.S. Declaration of Independence was forged in coffee houses on the Eastern seaboard. (Hmm, hotbeds of sedition…?) By 1843 there were more than 3000 coffeehouses in Paris. A Parisian coffeehouse was said to have been the root of the intellectualism that led to……. the French Revolution! The world’s very first (I’m not sure how this was substantiated) coffee house was opened in 1475 called The Kiv Han. An interesting Turkish law decreed that it was quite acceptable for a woman to ask for a divorce if her husband failed to provide her with adequate coffee rations. Brazilian and many South American coffee plants are said to have been the consequence of a love affair between a French Governor's wife and a Brazilian official. Upon parting she bestowed upon him a bouquet containing flowering coffee branches! In 1732, at the height of his creative genius, Johann Sebastian Bach wrote the Cantata No. 211 or Coffee Cantata. It is considered by many to be a work of perfection. At the time of its writing, the German public was very concerned about the number of women that were frequenting coffee houses. In the Cantata, a worried father scolds his daughter for her coffee habit, which she refers to as her dearest joy. The father implores her to quit, but the daughter continues to resist, telling him again and again, "Coffee, my one and only bliss is sweeter than thousands of kisses, better than sparkling wine." The girl finally renounces coffee only when convinced that no man will marry a woman with a coffee habit! The history of coffee is an extraordinary study. If you would like to know more about it, I enthusiastically endorse the book, All About Coffee, by William Ukers. It was written in 1928 and is one of the best books written on the subject to date. COFFEE HISTORY, FUN FACTS - COFFEE INFORMATION GALORE! When I find cool stuff, I post it! Such as this awesome directory for one of our favorite coffee information sites! 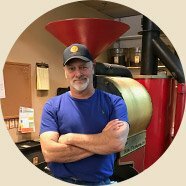 THANKS FOR VISITING OUR COFFEE INFORMATION PAGE!